I have been sent this amazing sketch of East Malling by Diane Brazier (a local resident for 33 years). It is a drawing that she bought on eBay. 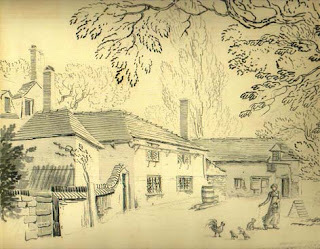 The drawing was carried out in 1816 and is a sketchbook study called "Offices at Mrs Norris. East Malling". Diane would love to know (and I'm sure everyone else who reads this blog) if anyone recognises the house or has a Mrs Norris on their deeds. Also, if anyone knows how I might approach researching a Mrs Norris from 1816, to find out more about this location, it would be gratefully received. More historical drawings and photos to come.